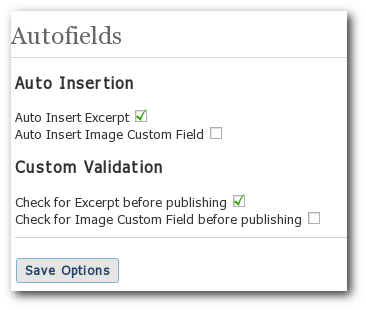 AutoFields Plugin will auto fill the Excerpt and add an Image custom field based on the data you entered into the contents editor. This plugin will set the first paragraph of the content as the excerpt and take the first image(if there are any) and set it as the ‘Image’ custom field(needed for some themes – like Mimbo – my theme). When you hit the publish button, it will check to make sure that excerpt and Image custom field are filled. If not, it will ask you to confirm before publishing the post. Download the zipped file from WordPress Plugin Repository page for Autofields. If you have any suggestions or notice any problems with the plugin, post it in the Autofields Plugin forum. Next plugin will be released tomorrow. This is what I have been seeking for. One question then, can we also config the image custom field cz some themes need different codes? Great idea for a plug-in. It doesn’t work for other themes because the custom field for the image isn’t defined. Will this plugin work if you are importing articles via an rss importer such as wp-o-matic or simply importing them from an xml file? The link, displayed on the installed plugins page, to your site goes to http://binnyva.com/ and not to this blog. You have to change the code of the plugin for that. Can you give me a list of the other custom field values used in other plugins? It will not work when importing articles – sorry – you will have to edit them manually. About the link, that’s ok – its the authors url – not the plugin url. Is there a way to modify this plugin for it insert 2 standart fields for all my post? Since I’ve been writing all my posts without these 2 custom fields, I need to insert them automatically. Its possible to do that – but you’ll have to edit the code to do it. Cool – I’ll add it in the next version. When will you release the next version of your plugin? I love the idea of your plugin, I’m using wp-o-matic to pull in Ebay RSS feeds and I need a way of adding some custom fields. I need a way of extracting “buyitnowprice” from the feed and adding the value as the “price” custom feed, I also need the image to be pulled from the content and added as “images”. Is it possible to do this with your plugin, would be able to make a donation if it is. Its not possible using the current version of the plugin. You’ll have to do custom coding to get that feature. Currently, there is only one custom field per image. If you need more, you’ll have to edit the code. may I know which line that I have to edit? Try autofields.php, line 83. Copy those multiple times to create multiple custom fields. I did try that but it does not work.